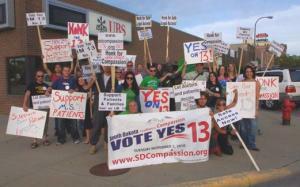 South Dakota medical marijuana patients and advocates are hoping that in two weeks the Mt. Rushmore state will become the 15th medical marijuana state. They came close in 2006, losing by only four percentage points, but think they can get over the top this time around. After that 2006 defeat, activists went back to the drawing board, eventually crafting a tightly-drawn medical marijuana initiative designed to win over a skeptical and conservative prairie electorate. The result, the South Dakota Safe Access Act, known on the ballot as Measure 13, would make the South Dakota medical marijuana law among the most restrictive in the nation. The initiative limits medical marijuana access to patients with a list of specified illnesses and conditions. It requires that patients be in a "bona fide relationship" with the recommending physician and provides for a state registry and ID card system. Patients are limited to an ounce of marijuana and six plants. They can designate one caregiver each, and each caregiver can grow for no more than five patients. Caregivers can be remunerated for costs, but cannot make profits. There is no provision for a dispensary system. "This initiative addresses the concerns of people in South Dakota about people who just want to use it recreationally," said Tony Ryan, a former Denver police officer who is now a spokesman for the South Dakota Coalition for Compassion, the group behind the measure. "They won't be able to get it. People were worried it would get into the wrong hands, so it is really restrictive, but it will get the medicine to the patients who need it and keep them from getting arrested or going to the black market." "I have a really good feeling about this," said Rep. Martha Vanderlinde (D-Sioux Falls), who sponsored a 2008 medical marijuana bill in the state legislature. "I think most of the people already have their minds made up. The more people I talk to, they say why not, if it's going to reduce the pain and suffering." Vanderlinde, who is running for reelection, has been talking to a lot of people. She said she had knocked on 2,500 doors during the election campaign, and while she didn't always bring up the initiative, many of her constituents did. "Just today, this little old lady leaned over and whispered 'How are you voting on 13?' and I told I had already voted for it, and she said 'Good,'" Vanderlinde said. "When people ask me, I tell them how I voted and that my father voted for it, too. People told me this was political suicide at the legislature, but my constituents don't think so," said the registered nurse. Bob Newland has been South Dakota's one man marijuana movement for years, playing a leading, if behind the scenes, role in the 2006 effort. After a pot bust near Rapid City last year, he was silenced for a year in an unusual sentence from a local judge, but now he's back, and he's cautiously optimistic. "Everything I see tells me we're going to win," said Newland. "I was very optimistic in 2006, and we had reason to be. We got 47.3%. All of those people will vote for us, so we got a hell of a start before we even got this on the ballot." Four years have made a difference, said Newland. "The national raising of consciousness and people's realization that, yes, this is of benefit to some people and it makes no sense to punish them have increased support," he said. And last time around, the Office of National Drug Control Policy under Republican drug czar John Walters sent representatives to South Dakota to hold press conferences with local law enforcement opposing medical marijuana. This time, there is no sign the drug czar's office will intervene in the state ballot measure contest. Newland kind of misses the drug warrior types. "I hope they come," he said. "Everything they say sounds stupid now, and we have a president and an attorney general who said they would quit arresting people in medical states." Indeed, it has been a low-key, low-budget affair on both sides of the issue. The organized opposition, Vote No on 13, has an amateurish web site themed around "Compassion Shouldn't Mean Addiction," and no apparent advertising budget. Its lead spokesman, Vermillion Police Chief Art Mabry, head of the South Dakota Police Chiefs' Association, is out of the office all month and unavailable for comment. Maybe Mabry needed that time off. He wasn’t exactly on message in an interview 10 days ago with the Rapid City Journal. "I think it's going to pass, I think South Dakota people are a caring people," he said, adding that the pro campaign will "tug at the heartstrings" of voters. Watertown Police Chief Jo Vitek, who will shortly replace Mabry as head of the chiefs' association, had a litany of problems with the measure. "The research on the efficacy of marijuana as medicine is limited," she told the Chronicle. "The FDA, along with most national medical associations, does not support smoked marijuana as medicine." Vitek also expressed concerns about administrative costs, citing the need to conduct background checks on caregivers and policing compliance. "In a state where significant 'cutbacks' have been made to balance an already tight budget, will positions be created to address the aforementioned matters?," she asked. "Who will pay for this added expense?" That question has an answer. Section 28 of the initiative, which discusses administrative rule-making and regulations, says: "The rules shall establish application and renewal fees that generate revenue sufficient to offset all expenses of implementing and administering this Act." Vitek worried about drugged driving as well, asking "Will we also see a rise in the crime rate?" And the chief expressed worry about "the health concerns of indoor marijuana grow operations," wondering whether caregivers would be required to meet code requirements, whether they would have to disclose their grows to their neighbors, and whether they would be required to have their homes inspected for black mold before selling them. Vitek said the chief's' association had put $2,500 into the effort to defeat Measure 13. That's not a lot of money, even in South Dakota, but law enforcement has other means of influencing voters. Last week, the South Dakota Highway Patrol issued a statement noting what it called a trend toward highway drug busts of people carrying medical marijuana cards from other states. It counted seven incidents. "That was clearly a political maneuver out of bounds with what the department should be doing," said an indignant Emmit Reistroffer, who has been the driving force behind the campaign during Newland's enforced absence. "We have one of the most popular east-west interstates in the country, and of course there will be some marijuana coming across. But no state allows licensed growers to take their product out of state, so pointing fingers at a handful of incidents where somebody abuses the program is really taking it out of context. I'm really disappointed," he said. "I'm biting my nails," said Reistroffer. "We are working hard as hell, we've had some huge rallies in Sioux Falls and Rapid City, we've had patients in the newspapers, we're really pushing this grassroots style," he said from a cell phone as he canvassed voters door-to-door. But the campaign doesn't have any money and, unlike two years ago, election dynamics are not working in the campaign's favor. Energized Republicans are expected to come out in large numbers in a bid to defeat Democratic incumbent US Rep. Stephenie Herseth-Sandlin, and a measure regarding public cigarette smoking is also on the ballot. "We're really struggling for funds, and we're going to have to pull this off in the most grassroots way imaginable," said Reistroffer. "This could have passed easily in 2008 because of the surge of voters then, but we expect a much smaller turnout this year." Now, barring last-minute explosive revelations, the die is largely cast. Neither side has the money for a late media campaign. Early and absentee voting has already begun, and it all comes down to getting out the vote. Good Luck, My Onetime Fellow Dakotans! I was a Sioux Falls resident for about five years in the 90's, during which I was glad to cast my vote for Governor to Bob Newland. ...and if you see Steve Hemmingsen, tell him I said "Bite me!" Honestly coming from an Alabama state prospective, you guys aught to pass this for cancer patients and other people suffering. Republicans should also support this poposal as it gives less Big Government and more of a heart in our debeletating and often times partisan governmental systems Enough with the worries on the vote cause the small insignificant things will be worked out in de time and its fiscally sound by the own words of the proposal. Alabama might pass ours next year from the sound of the legislature in Montgomer, Alabama, so beat us while you can! The Chief of Police Jo Vitek from the Watertown SD police department, soon to assume her statewide duties, is not the small town gal made good you might think. She is an oldschool drug warrior from the Broward County Florida Sheriff's Department. She was brought to South Dakota for her talent in aquireing Federal drug war money by a former mayor who was literally run out of town on Federal pork barrel corruption allegations. Chief Vitek is very good at her job. In just a few years she has had a new police station with all the bells and whistles built, increased her payroll fifty percent, and has all the local media eating out of her hand. I sure am glad I'm not paying for it.